It is eerily quiet at Forbidden Plateau these days. Where once the mountain teamed with the sounds of alpine enthusiasts at play, moving up and down the slopes atop a generous covering of powder, the area now looks bare-boned and sad, a carcass of yesteryear’s merriment pinned forgotten—sometimes frozen—in time. It’s early November. I park my vehicle in the empty carpark but before I open my car door I consider the pivotal question at hand. It’s a question of responsibility. Whose mandate is it, if any at all, to dedicate the necessary time and resources to clear this site—including that iconic pink chairlift shooting toward the top of the mountain—to restore Forbidden to its natural state of beauty? Or is there genuine potential, after years of relative inactivity, for a company or organization to invest in the site to turn it into something new and alive? 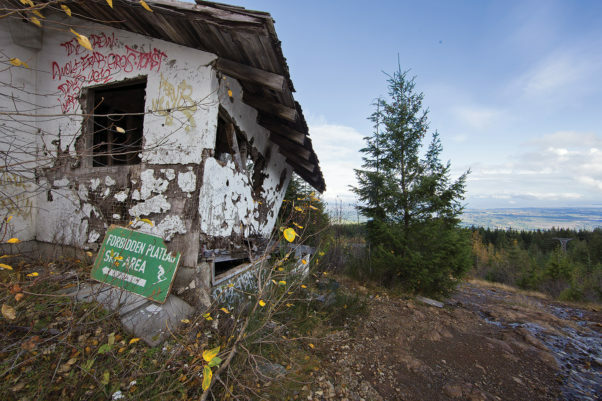 I leave the car and walk past the spooky neon-grafittied concrete slabs of the former ski lodge, past small sites of scattered beer cans and garbage, then push on up the steep crest toward the summit of Mount Becher. Winter shows its early arrival. The air is crisp, the tall trees airbrushed white. I pass more wooden-structured reminders of bygone days, resting lopsided and limp, then continue uphill below the remains of the old ski lift, a pinkish, rusted mechanical caterpillar that stands transfixed for several hundred metres up the mountain slope. Out here alone, one word strikes me with repeated urgency—‘stilllness’. So very, very still. I push on, wary of bears, but I see nor hear none. A few birds jester in the sky, but apart from that I slowly trudge along with my own breath as the only soundtrack, my body as the only hint of movement on the mountain. I am struck by a sense of deep awe, fascination, and, suffice to say, a feeling of uneasiness that washes over me. I just cannot get over the absoluteness of the silence; the quiet of a place so vast. It is an over-arching thing, beautiful but smothering, an almost tangible energy. It’s off putting but delicious. How can a place that hummed with activity for so long, still here as beautiful as it ever was, be so strangely quiet? Forbidden’s history is long and storied, the name of the place evoking memories of times past. Legend has it that when the K’omoks First Nation faced raids from other coastal tribes, they took their women and children to the plateau for safekeeping. Once, during a raid by the Cowichan tribe, the women and children vanished without a trace, and when a member of the K’omox tribe went looking for them within the Forbidden Plateau, he found red lichen covering the snow and nearby rocks. He aassumed the lichen to be blood from family members. Since then, according to some sources, the plateau has become taboo for members of the K’omox First Nations community as it was believed that it was inhabited by evil spirits who had somehow consumed those they had sent during the raids. Fast forward to the mid-1920s when early pioneers to the Comox Valley earmarked the area for possible water sources and agriculture, and later hiking tours, lead by a waterworks engineer named Clinton Wood. In the 1930s, the first lodge was constructed under Wood’s ownership, which allowed better access to the vast landscape. Slowly the mountain gained a reputation as an excellent venue for winter fun, but the area did retain a strong element of mystique with many accounts over the decades of missing people and sordid mishaps among mountain users and employees alike. In 1946, Forbidden Plateau was the epicentre of a devastating earthquake, which registered a massive 7.3 on the Richter scale. This rumble still represents the most powerful, on-land earthquake ever to hit Canada. Incidentally, that same year Clinton Wood and his wife Mary sold the lodge as they reportedly could no longer spend time there after their eldest son was killed during WWII. Despite the legends and the effects of the quake, the first ski lifts were installed in 1949 as part of the establishment of Wood Mountain Ski Park. Skiers revelled on the slopes with the mountain peaking in popularity throughout the late 1960s and 1970s. When Mount Washington opened to the public as a ski locale in 1979, and a few warmer than usual winters hit, ski operations at Forbidden faced huge challenges. In 1999, massive snowfalls caved in the roof of the day lodge and all ski lifts ceased running from that day. Since then, numerous fires have torn through the remains of the old lodge, adding a charred juxtaposition of black on white during most winter months. Now Forbidden sheds an aura of a place that has been left behind, fending for itself, often below the snowline even in mid-winter, and with ever-ailing infrastructure and no cheque book in sight. Present day hikers and toboganners still use the area for wintery pleasure, as do a few hearty snowboarders. But for the most part it is now known as a dilapidated site requiring much-needed attention to wash away the wear and grime of almost two decades of inactivity, allowing for the magnificent land to rest in a state befitting its natural allure. The future of Forbidden has long been on the radar of Comox Valley Regional District (CVRD) Area C Director, Edwin Grieve. After numerous folks within his jurisdiction sought answers regarding the run-down state of Forbidden, Grieve agreed to take action. For the past three years he has been at the forefront of efforts to raise awareness with the provincial government of the need to clean up the area. Last year, with support from regional directors, the CVRD Board wrote to the province to seek funding for remediation of the area. Slightly disgruntled but determined, Grieve and others set to forming a steering group, whose mandate is to “remediate the mess and restore it to its natural state of beauty.” The group includes MLA Don McRae, BC Parks delegates, and numerous individuals and businesses from the Comox Valley including four trucking and excavating companies, an insurance company and a law firm, all of who have agreed to work pro bono on the clean-up project. Importantly, the society also has the cooperation and input of the K’omox First Nations band. After three years, the group is now in the process of forming the Forbidden Plateau Reclamation Society. Grieve adds that the idea to form a formal society was borne out of the need to channel necessary funds to complete the work as well as carrying insurance to indemnify machinery operators, drivers, and workers on site. BC Hydro, the CVRD and TimberWest have agreed to collectively raise “seed funding” to kickstart the clean-up to the tune of approximately $20,000. A local waste management landfill has tacitly agreed to accept all refuse and rubble while waiving the usual dump fees, and the ministry of transportation and infrastructure has offered extra road maintenance to accommodate the extra truck traffic. It’s a collective effort that has inspired Grieve and others to pursue to the project through to completion. Grieve is optimistic that the chain of events is moving, and while he concedes the society still needs to get “their ducks in a row”, the time is fast approaching for visible clean-up action on site at Forbidden. 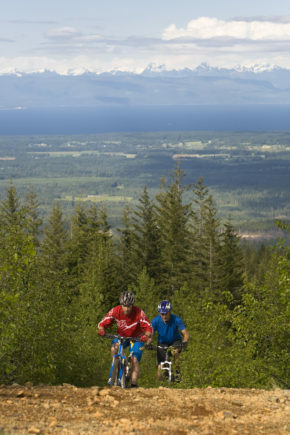 In the meantime, he has been part of informal discussions with local groups such as the United Riders of Cumberland in the hope that they can ride the existing wave of goodwill between themselves and forestry companies to possibly utilize the Forbidden area as a mountain biking resource. Operating under the public radar and without need for fanfare, local snowboarding company JumpCamp have been breathing life into Forbidden every year since that tumultuous winter of 1999 when the day lodge collapsed. Conditions permitting, JumpCamp uses the slopes of Forbidden Plateau as their primary base of operations. Patrick Kitto, owner and head coach of JumpCamp, and some of his buddies grew up riding at Forbidden and when ski operations ceased, they took advantage and moved into the wintery paradise. “Some of the guys in JumpCamp grew up on the road at the bottom of that mountain and some of us have bought property there to keep close to the goods. The whole crew loves the natural terrain and with the ski hill abandoned, we had our own private mountain. 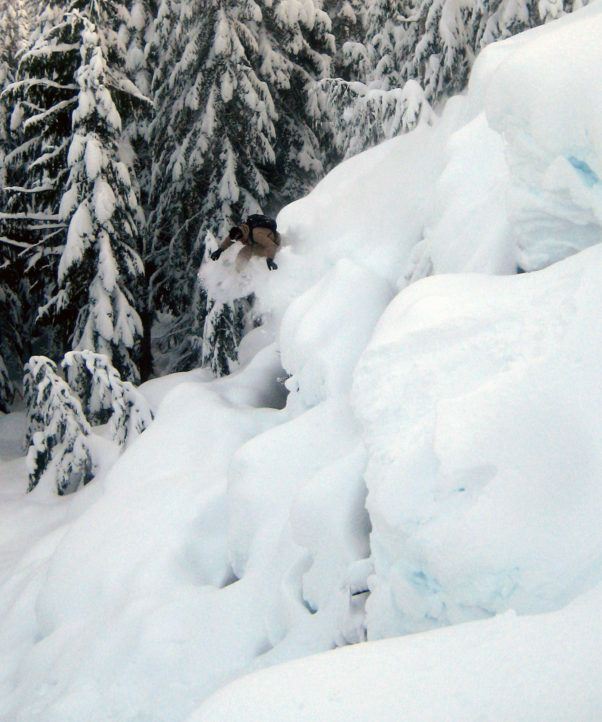 Kitto feels that BC Parks should instead focus on maintaining clear access to the base of the mountain and beyond. “I would like to see the alder trees cut down on the hill to allow for easier access and better snow pack, and the implementation of a plan to inform the public, such as maps of trails, and what’s allowed up there and what’s not. The Parks are just not doing their part to inform people. And simple things too like providing small washroom facilities and some garbage cans so junk isn’t left behind on the mountain would be a sensible addition. Amongst the silence and eerie stillness of Forbidden, the ghost-mountain that was in many ways simply left behind, the uneasiness never really leaves me until I return to my car and begin to head back down the muddy, jutted road. Then, I can’t help but reflect on the long history of the area. I can almost hear the sound of First Nations song, of early white settlers ‘discovering’ the magic of the vast plateau, of story-telling journalists scrawling myths of blood and intrigue, of little kids on skis with moms and dads encouraging, of bulletproof teens drinking and discarding empty beer cans into the tundra and climbing on things they shouldn’t be on. I imagine excavators clawing at the chairlift and concrete rubble and rumbling up and down the mountain. Amid a storied history and many unknowns yet unanswered, one thing is certain. Whatever happens, this gorgeous landscape will always be one of the most spectacular and intriguing locations on all of Vancouver Island.